About 90% of the catfish that are imported into the U.S. today come from Vietnam. Antibiotics that are banned in the U.S. is used in their farming practice. To compound that problem, two species, Swai and Basa, that are not topically considered as catfish by our federal government, do not fall under the same inspection requirements that other imported catfish do. So the answer is to stick to domestic armed raised catfish, because they farmed responsibly, and are one of the best fish you can eat. We buy our catfish for Alabama and it comes in frozen 5 to 7 oz. fillets…great fried in the skillet or blackened. 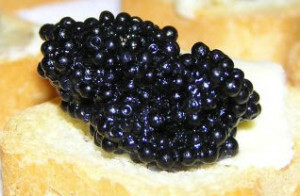 Caviar: Bad choice and Why –Here are some clues. 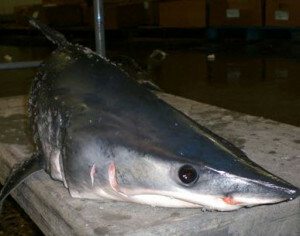 Wild-caught sturgeon and caviar that come form beluga have been susceptible to problems of over fishing. This is according to the Food and Water Watch report. They also have the threats caused from dam building that in turn pollutes the surrounding water they live in. So the answer is to choose the instead the American Lake Sturgeon caviar or from the Mississippi River American Hackleback/shovelnose Sturgeon caviar. Atlantic Cod: Bad choice and Why – Due to the economic health of the New England fisherman, this is a tough chose to pick on, but because of mismanagement from the National Marine Fisheries and due to a low stock status the Atlantic cod stocks saw a collapse -in the mid 90’s and are in a disarray because of it. 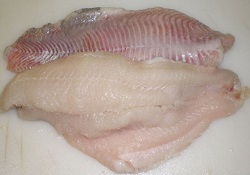 Pacific cod are strong and widely used for the “fish ‘n’chips” menu of choice. American Eel: Bad choice and Why -Referred to as yellow or silver eel also show up in sushi dishes, are found to have high levels of PCB’s, mercury and suffer from pollution and over harvesting. You might want to try Pacific or Atlantic Squid instead. Shrimp-Imported: Bad Choice and Why – Imported shrimp are actually considered the worst of the so-called dirty-dozen in the list of 12 to avoid. It is also the hardest to avoid since 90% of the shrimp sold in the U.S. are imported. 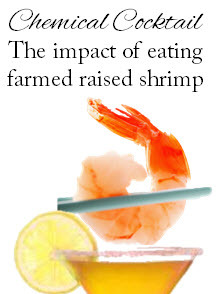 Farmed shrimp come into this country with a large list of contaminants, including antibiotics, residue from chemical used in the farming process, mouse and rat hair and insects, not to mention the E.coli that have been detected from the imported shrimp. You see shrimp in the grocery stores and served in restaurants, but before they get there, they have had antibiotics injected, doused in pesticides and chemical-laden food fed to them. Water and soil treatment detergents are used to control viral, bacterial, fungal and other pathogens; to induce plankton growth (fertilizers and minerals), and to inoculate the farmed shrimp larvae. The best choice is to stick to shrimp from the Gulf. Pink shrimp from Oregon is a good choice. These fisheries are certified and comply with the Marine Stewardship council guidelines. Atlantic Flatfish: Bad choice and why – Flounder, sole, and halibut caught off the Atlantic coast are a bad choice because of heavy contamination and over-fishing going back to the 1800’s. 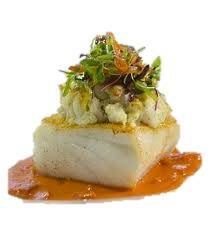 consider Pacific halibut or domestically farmed tilapia and catfish. Tilapis tocos are good! Atlantic Salmon: Bad choice and Why -Wild or Farmed: Capturing wild Atlantic salmon is actually illegal because of a low stock count, which is due to farmed salmon. There are a couple the things to note about farmed salmon, which include, the fact that they are crammed into pens which opens the doors to diseases and parasites like sea lice, which in turn require antibiotics and pesticides to control. Because many escape and compete for food the the wild native fish, this leads to the decline of in the native population. Because of this issue the FDA is moving towards approving a “genetically engeneered” salmon that can be sold. Really! That salmon is expected to be farmed off the coast of the Panama, and we are not sure of exactly how that will be labeled! Is Your Fish Fake? King Crab-Imported:Bad choice and Why Problem-Most of the crab that is imported into the U.S. comes from Russia, where the limits are not enforced. 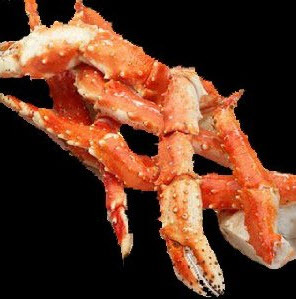 These crabs are usually mislabeled as Alaskan King Crab which are found in the supermarkets labeled “Alaskan King Crab, Imported”. Alaskan King Crab are a entirely different species. About 70% of the king crab in the U.S. is imported and it’s important to know where it originate from. Shark: Bad choice and Why – Shark is extremely high in mercury posing a real threat to humans with consumption for one thing, and on the other hand, the ocean ecosystem suffers as well. The species that sharks like to eat, such as the jellyfish and cownose rays are eating and depleting scallops and other fish. So now you know why the price of scallops have gone UP! 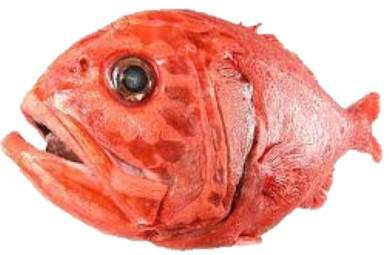 Orange Roughy: Bad Choice and Why – Besides the very high levels of mercury, it take orange roughy 20 to 40 years to reach full maturity and they reproduce very late in life, which makes it difficult to reproduce. The orange roughy, red roughy, slimehead or deep sea perch, Hoplostethus atlanticus, belonging to the slimehead family….. There are NO fisheries of orange roughy, though you some times see it in super markets mislabeled as “sustainably harvested”- that is absolutely wrong. Try yellow snapper or domestic catfish instead. Atlantic Bluefin Tuna: Bad choice and Why – The new York Times recently found that Atlantic bluefin tuna contained the highest levels of mercury than any of the species of tuna. They are also over harvested and reaching the endangered list according to the International Union of Conservation of Nature. If you have to have tuna of the plate, opt in for American or Canadian, (but not imported), or albacore tuna, does not have high levels of mercury. Chilean Sea Bass: Bad choice and Why – Most of the Chilean sea bass sold through out the U.S. came form fisherman who caught them illegally. They are en-danged and will be commercially extinct in five years if this practice continues. Haddock is a good substitute. 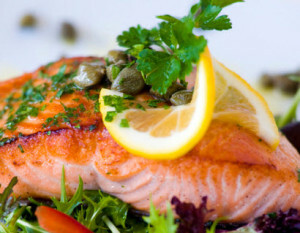 My choice in fish is always Salmon from the Faroe Islands. Rather than good through all the reasons, here are a few snippets from the web site. I would suggest to visit the website. There are only 3 companies that produce and export farmed salmon from the Faroe Islands. The vertical integration allows producers to have full control over the quality of the salmon from roe to export. Due to the small size of the Faroe Islands, these transport times are extremely short, guaranteeing optimal freshness and quality. Be sure to come buy and try some of this super-tasty Salmon.